The old adage “What goes up must come down” is as true for trading and the economy as it is for any physical object. 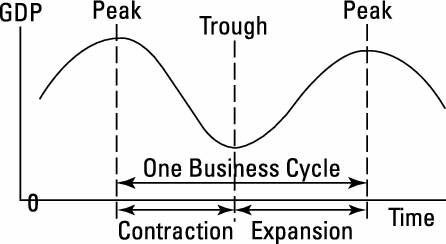 When a business cycle reaches its peak, nothing is wrong in the economic world; businesses and investors are making plenty of money and everyone is happy. Unfortunately, the economy can’t exist at its peak forever. In the same way that gravity eventually makes a rising object fall, a revved up economy eventually reaches its high and begins to tumble. Peak: During a peak, the economy is humming along at full speed, with the gross domestic product near its maximum output and employment levels near their all-time highs. Income and prices are increasing, and the risk of inflation is great, if it hasn’t already set in. Businesses and investors are prospering and very happy. Recession: As the saying goes, all good things must come to an end. As the economy falls from its peak, employment levels begin to decline, production and output eventually decline, and wages and prices level off but more than likely won’t actually fall unless the recession is a long one. Trough: When a recession bottoms out, the economy levels out into a period called the trough. If this period is a prolonged one, it can become a depression, which is a severe and prolonged recession. The most recent depression in the United States was in the late 1920s and 1930s. Output and employment stagnate, waiting for the next expansion. Expansion/recovery: After the economy starts growing again, employment and output pick up. This period of expansion and recovery pulls the economy off the floor of the trough and points it back toward its next peak. During this period, employment, production, and output all see increases, and the economic situation again looks promising.